Congregations are the reflection and manifestation of the body of Christ on earth. They are the hands of God at work in the world. God touches and transforms lives through congregations. That is why we say the North American Lutheran Church is a mission-driven and congregationally-focused church of Jesus Christ. As a church and as a movement we have adopted a congregational vision for mission and have developed five teams to assist congregations in driving forward mission at the most local level. Continued development of Mission District Mission Teams to help congregations engage in the Great Commission by: discipling faith communities grounded in the Lutheran tradition; developing relationships with local, domestic, and global partners; and planting churches and new mission starts. Resource the Great Commission Society Team. The primary focus of the Great Commission Society is developing an active strategy to connect each NALC congregation in relationships with local, domestic and global missions. The GCS has developed a vetting team so that congregations and individuals looking to partner with different missions can be assured of the mission’s legitimacy and fiscal responsibility. Another facet of the Great Commission Society is its work to develop transitional and emergency aid through financial support by its members. If you are a congregation or individual who would like to connect with a mission — or a mission organization seeking support through a listing with the Great Commission Society — please visit: www.thenalc.org/great-commission-society. 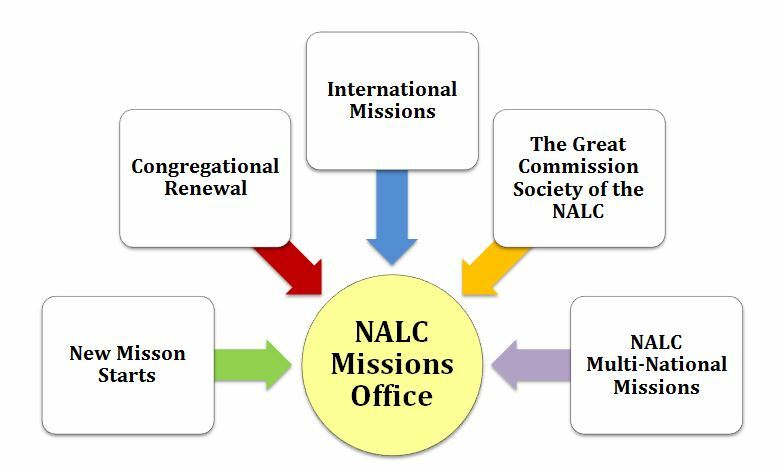 In addition to these four areas of focus by the NALC Missions Office, other mission teams are working diligently to provide for the needs and resources being requested by congregations. The International Mission Team will be focusing on developing a strategy for encouraging more full- time missionaries. They will also be working with Theologians Without Borders to share our resources (our pastors and lay leaders) around the world where people are desperate for teaching and instruction. For more information please visit www.thenalc.org/theologians-without-borders. Our Congregational Renewal Team will be working with NALC staff and the NALC Executive Council to advance the goal of each professional leader in the NALC being in a coaching relationship. The team will continue to develop a resource bank of teachers, preachers, and experts who can be deployed to congregations and Mission Districts to teach on specific topics as well as be devoted to caring for the souls and needs of our pastors by being a resource to the Assistant to the Bishop for Ministry. Our New Starts Team will be following up with those in attendance at the 2014 Mission Festival to provide resources as detailed in the participants’ action plans. They will also be looking to partner with Life Together Churches in offering additional consultation, resources and training opportunities to our leaders and congregations in order to equip them for participation in our house church planting project. Click on the links below to connect with available mission and discipleship resources. Be sure to check these pages often for updates, new training resources and additional information as these initiatives move forward.